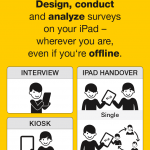 With Feed2Go you can design, conduct, and analyze surveys on your iPad—wherever you are, even if you’re offline. Waiting for feedback is a thing of the past! Instead, you’re in charge of when, what, from whom, and how many responses you get. Surveys and feedback are as flexible and professional as you need them to be. * No need for a computer—everything is on your iPad!